This famous bird has appeared in a number of magazines and media shows -Rupert Sheldrake, the fringe wizard biologist from Cambridge, performed double-blind tests where N´kizi demonstrated an uncanny ability to tap into her owner and friend Amiee´s mind. The experiment’s data has a 1 in a 1,000,000 chance of happening randomly. For more on the N´kizi’s project log onto http://www.sheldrake.org/nkizi/. 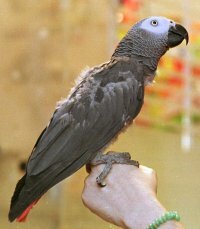 N’kisi is a captive bred, hand raised Congo African Gray Parrot. He is 4-1/2 years old, and his species has a life span similar to humans. He has received teaching in the use of language for 4 years. He is now one of the world’s top “language-using” animals, with an apparent understanding and appropriate usage of over 900 words. Aimee intuitively taught N’kisi as one would a child, by explaining things to him in context. (This goes beyond typical interactions with a “pet”, involving many hours per day of teaching and conversations.) He is treated as a member of the family. N’kisi was not trained like a performing animal, and does not just mimic or use speech “on cue”. Instead, he has been allowed to develop his own creative relationship to language as a means of self-expression. N’kisi speaks in sentences, showing a grasp of grammar in formulating his own original expressions. He is capable of actual conversations. He often initiates comments about what we are doing, feeling, looking at, thinking, etc, which is how we discovered his ability to read minds. N’kisi often demonstrates telepathy in spontaneous situations, and also communicates love, compassion, and a keen sense of humor. Language-using animals are like “animal ambassadors” helping to bridge the worlds of other species with our own. In the wild, parrots live in large flocks with complex social interactions, which have yet to be studied.